Driver Performer is a computer application that is said to examine the system and search for the relevant drivers in order to improve the performance of the hardware. It is presented as tool that helps to enhance the performance of the user’s printer, graphic cards, scanner, and many other internal computer devices. The application works on Windows XP, Windows Vista, and Windows 7. There are two types of the application, one of which is a premium version which cost about $30. However, computer specialist categorized this application under the potentially unwanted program (PUP) category due to fact that Driver Performer causes a variety of malfunctions of the system. A lot of computer users find this application useless due to the inconvenienced caused. For example, the computer may become incapable of starting up normally. You may need to restart the computer and way another 10 minutes or more for the computer to start running normally. 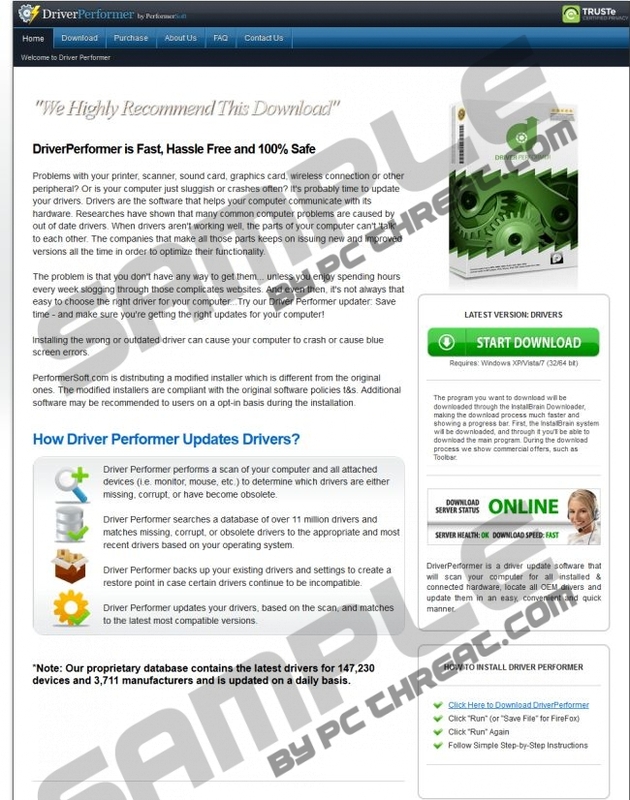 The application is available on different websites, including driverporformer.com, performersoft.com, and cnet.com. We advise you against downloading this application as if you do so, soon you will find out that Driver Performer does not fix the errors which you known to exist in the system. Moreover, you may come across this application or rather receive a suggestion for installing Driver Performer once the system loads. It is regarded as one of the types of drive-by downloads when the computer user is advised to install an application which may not be necessary at all. What is more, it is important to make sure that your Windows Firewall is turned on. If you have already installed Driver Performer and want to remove it, first you can try to use the Windows Control Panel in order to uninstall it. However, it is possible that you will not find Drive Performer listed on the Add or Remove Programs list. In such a case, it is advisable to use SpyHunter which will examine the system, and detect and remove Driver Performer. It will be detected as PUP.Driver Performer, and if you still want to remove it manually, use a free scanner which is available below in order to find out the components of the program and their locations. Quick & tested solution for Driver Performer removal.